One of several themes on this Blog is the coastal zone. With more than 85% of Australians living within 50 kilometres of the coastal zone and the clamour for coastal views such an Australian obsession, the way we manage this zone is a pressing issue. More often than not we’ve been quite neglectful in our approach to coastal management, in the past. The most recent case of the scuttling on ex-HMAS Adelaide, off Avoca, is yet another example of such mismanagement. The day of the scuttling, last month coincided with a trip up to the far north coast of NSW for me. It was an apt note to start on because much of what I witnessed along out beautiful coastline reflected varying degrees of mismanagement. Perhaps the single greatest issue has been the mismanagement of the dune systems along the eastern seaboard, first through sand mining cheap attempts at revegetation and remediation, the second in building on foredunes. What follows is a series of videos that I shot for my students when I was teaching geography some years ago. The videos address coastal processes and management issues. As a first step, I picked up an excellent small HD video camera, the Xacti, made by Sanyo in Indonesia and, I believe, now acquired by Panasonic. It’s small and without a monopod, it’s very hard to hold it steady, but the resolution is excellent and it produces a 1920 x 1080 pixel format. These videos are for students studying Stage 5 of the School Certificate Geography course, in NSW, Australia. They were shot using the Xacti, HD video camera made by Sanyo and edited using iMovie. The still frame graphics were made using Adobe Illustrator and Photoshop. Please feel free to download these videos. Creative Commons copyright applies. Rocky Coastlines 1 by Russell Darnley is licensed under a Creative Commons Attribution-NonCommercial-NoDerivs 3.0 Unported License. Rocky Coastlines 2 by Russell Darnley is licensed under a Creative Commons Attribution-NonCommercial-NoDerivs 3.0 Unported License. Coastal Processes on Wave Dominates sandy Coastlines by Russell Darnley is licensed under a Creative Commons Attribution-NonCommercial-NoDerivs 3.0 Unported License. Coastal Vegetation by Russell Darnley is licensed under a Creative Commons Attribution-NonCommercial-NoDerivs 3.0 Unported License. In the following clips “Coastal Management – Byron Bay 1 & 2” you are asked to stop the video and find certain locations in Google Earth. When attempting this activity it’s sufficient to type the latitude and longitide in the Google Earth search window using in degrees minutes and seconds, without the usual symbols. The diagram shows what you must do. Coastal Management – Byron Bay 1 by Russell Darnley is licensed under a Creative Commons Attribution-NonCommercial-NoDerivs 3.0 Unported License. Coastal Management – Byron Bay 2 by Russell Darnley is licensed under a Creative Commons Attribution-NonCommercial-NoDerivs 3.0 Unported License. I’ve always had an interest in video production and as anyone who reads the biographical background on this blog will already know. Some of my earliest experience was in educational television production, at the University of Sydney Television Service, back in the late 1960s. At that time I operated a camera not unlike this one. It was an Image Orthicon Camera. Curiously finding images of these cameras was difficult. Eventually I came across this one on a US site. It’s from the website ‘Big 13 WTVT A Historical TV Website dedicated to WTVT, channel 13, Tampa, Florida.’ The site is definitely worth a serious look if you’re interested in television of the B&W era and beyond. Back then we operated a studio and outside broadcast van. 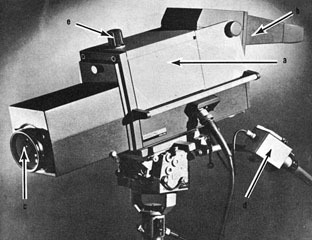 For the most part, the studio cameras were older Vidicon cameras one had a fixed lens, the other had a turret with three fixed lenses. This interest has continued. I haven’t always been directly engaged in video production but for many years I was very much engaged in still photography, particularly while living in Indonesia. Eventually, I put the camera aside for a good while, while I was living in Indonesia. It became obvious that effective engagement with other cultures was something that had to be done face to face. Cameras can be a mask behind which cashed up travellers from the developed world hide while snipping pre-formatted glimpses of their reality. Capturing the image can be so instantaneous. Often little remains of context, the foundation for reflection on deeper meanings. The photograph can become the photographer’s artefact the meaning of that situation in the photographer’s interpretation. This isn’t to devalue the central importance of serious photographers who’ve used their art to explore contexts more thoroughly, who’ve spent time coming to know their subject before snapping into their own observations. One factor triggering my long break from photography was a chance meeting with technically well equipped German photographer. At the time he was photographing Georgetown, Malaysia. His method was to shoot with a large zoom lens while wearing high fidelity earphones and listening to Beethoven. This gave me pause for thought and later was an influence in my own decision to abandon the SLR. My journey back to photography was motivated both by the emergence of digital technologies and by the increasing need to build quality digital learning materials for school education. In 2003 I started work with The Le@rning Federation as a Script Writer in the LOTE2 project and Subject Matter Expert in SOSE 2 and 3. I was immediately able to begin drawing on some of my old photos and putting them to good use in the construction of learning materials, either as elements of Learning Objects or merely as background briefing materials for graphic artists. So to cut a long story short, both video and still photography will become a bigger feature of this Blog.